I think the most important first paper related Solubility Parameter and Adhesive Agent is next paper. 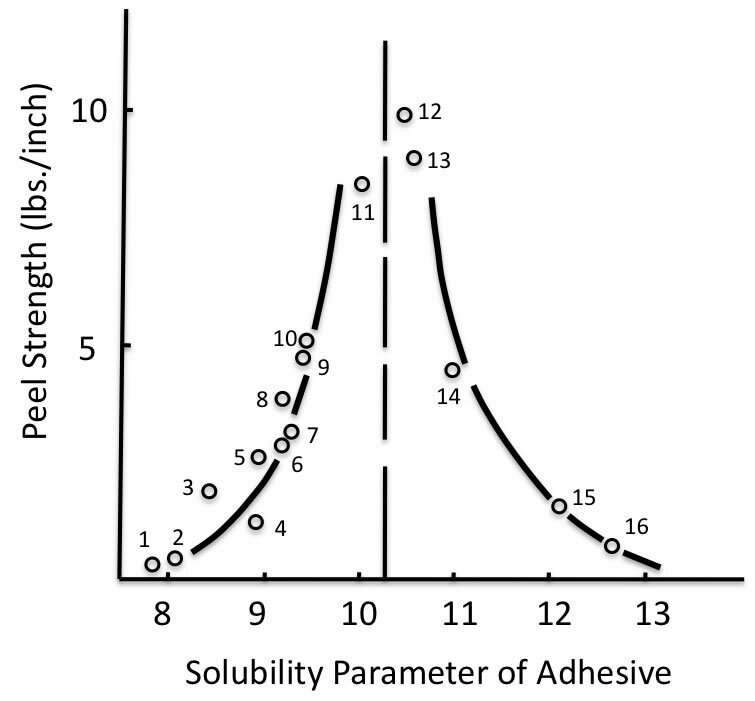 They measured Peel Strength of PET with several Adhesives. With this result, they concluded PET Solubility Parameter should be 10.3. The same year, Charles M. Hansen wrote very important Book. 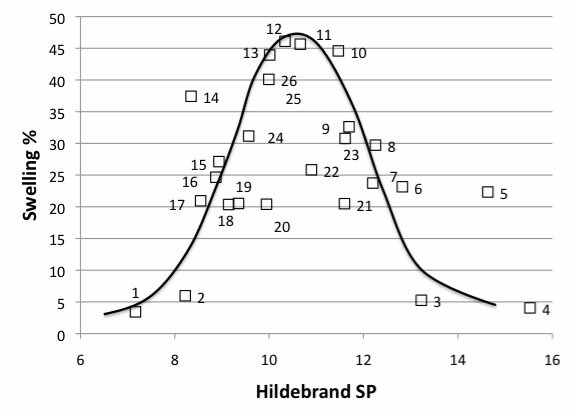 After Hansen Solubility Parameter(HSP) were published these adhesive phenomena are also analyzed with HSP. At the beginning, it was very hard to get 3D chart. 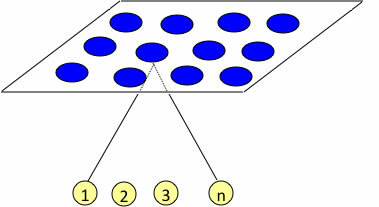 So researcher used 2D plot. 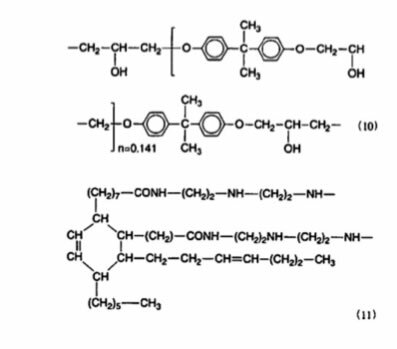 The above figure is Chloroprene rubber adhesive solubility to solvents. I got this rubber HSP [19.12, 3.74, 4.45] and the Radius 7.2 instantly. 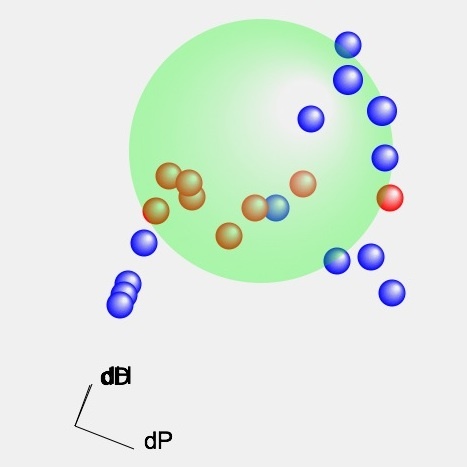 Please check which 2 poor solvents cross into the green Sphere. The other example is Epoxy Adhesive. I got the Epoxy Resin Swelling data. 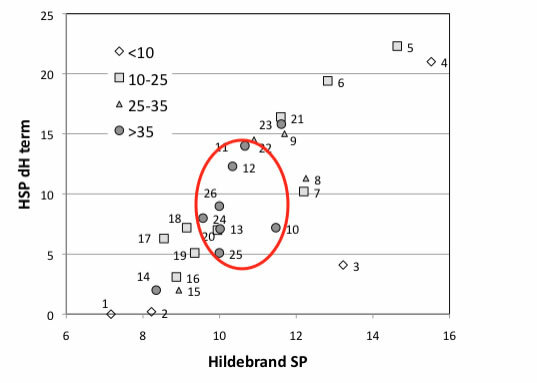 From this chart, we can easily understand Hildebrand SP means nothing. Even same SP value, swelling ability is so different. 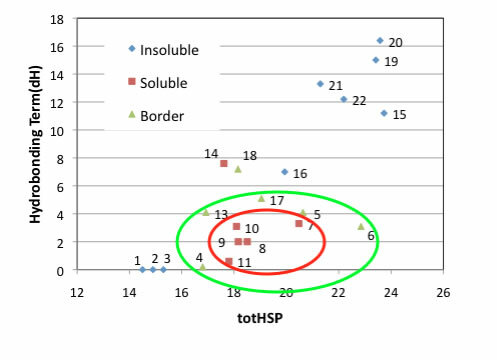 If we use HSP, we can easily understand good swelling solvent make domain. You can handle Solvents mixture easily. This epoxy resine is made by EPIKOTE828 with VERSAMID125. Epoxy produce hydroxy group when polymerize, so by nature, epoxy resine has hydrophobic domain and hydrophilic domain. 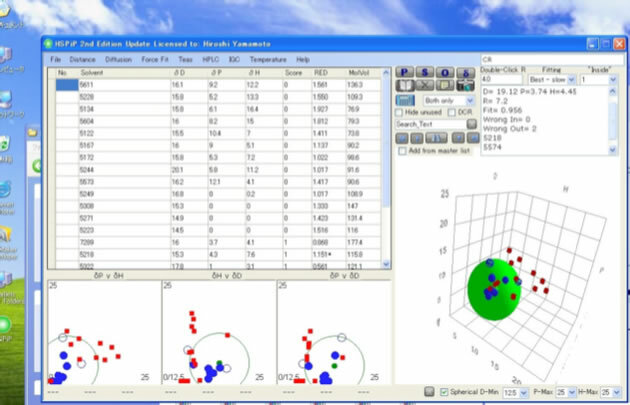 Now we developed new Sphere option that treat double spheres. 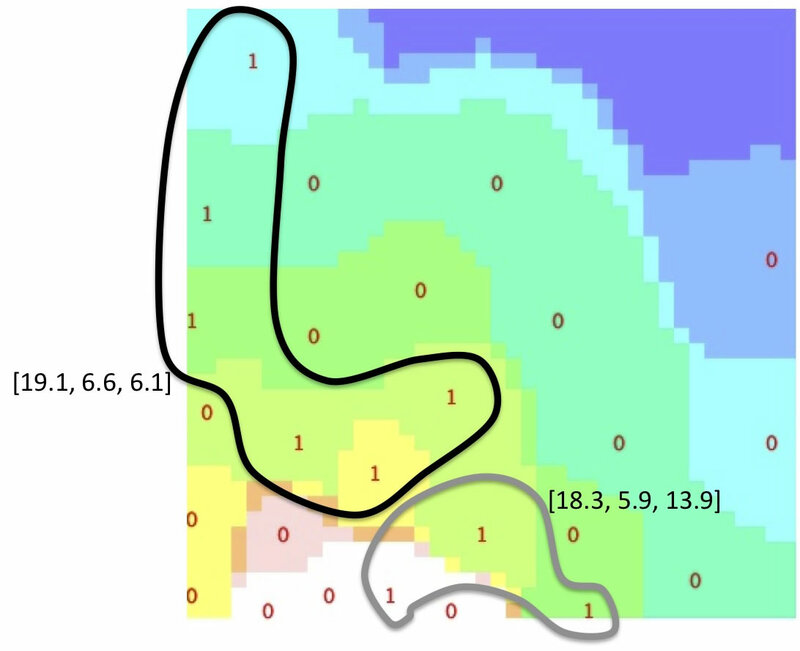 When run the Double sphere program, it found two domain [19.1, 6.6, 6.1] and [18.3, 5.9,13.9]. 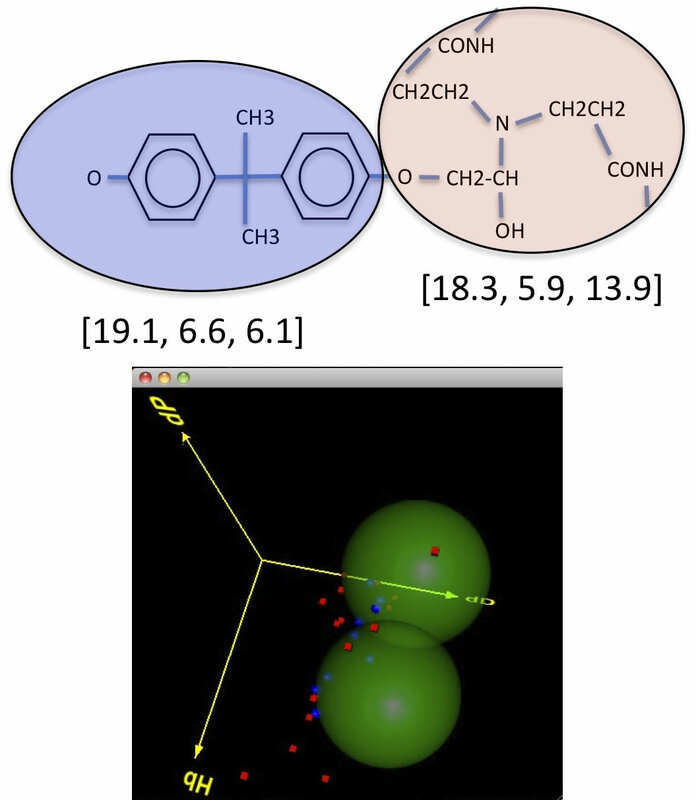 And we can check which solvent belong to which Sphere with using Self Organization Map(SOM) technique. These micro phase separation of epoxy resine may make enhance adhesive ability so much. You can try this Double Sphere algorithm with HSPiP ver. 3.1! Intrinsic Viscosity of polymer solution.